This item is in our medicine cupboard to deal with bug bites and scrapes. 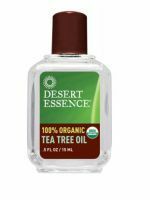 I notice Tea Tree oil is used in many different products like shampoo and lotion now. Personally, I don't see how anyone can use items on a daily basis with this natural medicine. The scent is very strong and it is a powerful oil. It's great to use something natural to take care of ourselves but I wouldn't use it on a daily basis if there is no need. If you breakout, not like cystic acne, this is a good product. i was using this for a while before I had to stop. This really helped to clear up my blemishes. My skin cleared up but it was also drying out. Here are several other uses: 1. Problem skin- Wet a cotton ball. Apply 1 drop of Tea Tree Oil. Apply lightly to problem skin to help reduce oil that can lead to blemishes. Remove with wate...read morer. Tea tree won’t cause dryness and flaking like some chemical treatments can. 2. Manicure/Pedicure Treatment- Add a few drops to manicurist spray or cream for cuticle care and welcomed relief for cracked nails. Also known to help ward of fungus. 3. Scalp Treatment- Mix a few drops into your shampoo to break up product build up and oil. Leaves hair squeaky clean. 4. Baby Care- Keep your diaper cleaner clean and fresh with a spray of tea tree oil mixed with water. 5. Laundry Freshener- Add 2 teaspoons of pure oil to a regular load of laundry during the wash cycle. 6. Multi-Purpose Cleaner- Add one teaspoon of pure oil to a little over a gallon of water and give windows, floors, tile and kitchen surfaces the thorough, chemical-free clean. 7. Stain Remover- Apply pure oil to damp cloth to remove scuffmarks from a vinyl and/or linoleum floors. 8. Bath and Tile Cleaner- Use an oil and water solution on shower doors to prevent soap buildup. After washing down walls and removing grime and mildew, wipe over again to prevent mildew re-growth. 9. Pest Control- Household ants and other pests dislike tea tree oil, so a few drops put at the point of entry will deter them. Wipe cupboards out with an oil and water solution to deter moths. 10. Mold Removal- Add 2 teaspoons of pure oil to 2 cups water. Shake to mix. Spray on mold and wipe clean. It doesn't matter what brand you use, this stuff is miracle potion. Use it as a spot treatment cause it can be drying. check out melaleuca dot com for more miracles of this stuff.